What’s fourteen-year-old Simon Mugford to do if he can’t remember anything before seven months ago? Draw, that’s what! Well, at least that’s what his grampa tells him to do. But he also tells Simon to chew on stinky roots, so Grampa’s sanity can’t be completely trusted. However, Simon draws anyway, because, well, it can’t hurt can it? And besides, he’s discovered he’s a pretty good artist, if he may say so himself. One night, Simon has a bizarre dream that not only jogs a few memories and messes with his sketches, but also sets his life on a new course. He wakes up with half of a key in his pajama pocket and a feeling that he’s not just the average fourteen-year-old boy he thought he was. As he attempts to fit the scattered jigsaw-puzzle pieces of his life together, Simon quickly discovers he’s right in the middle of a dangerous plot. And it’s up to him to free his best friend, and the Two Realms, from a deadly curse. SMUDGE’S MARK was chosen as tween magazine, The Magazine’s, Book of the Month for November, 2009 and was named as a January Magazine Best Children’s Book for 2009. SMUDGE’S MARK has also been given positive reviews by community members, bloggers, and top Canadian book review magazines, namely CM Magazine and January Magazine. 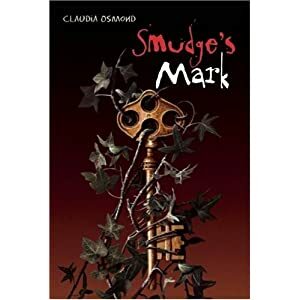 SMUDGE’S MARK was also honoured as a Best New Book for Young People, 2009, by the Association for Canadian Publishers, and was featured in the fall 2009 issue of the Quill and Quire. Get to know the characters in Smudge’s Mark, here, with these character interviews. My grampa was a wicked prankster. Usually, after working the part-time midnight shift at the Mushroom Farm, he’d make his way home to number 49 Stone Elements Drive in the darkness of the early morning. But not before pulling a stunt on someone. And they weren’t just Nicky-nine-doors kinds of stunts either. Once, he covered all the cars in our neighbourhood with dirt and wrote “Wash Me” on the windshields. Another time, he made random designs all over the sidewalks, driveways, and roads with colored chalk, and the time before that he drew flames on all the windows with what looked like red and orange paint. One time, he even smeared a horrible-smelling, soft cheese on everyone’s doornobs. Needless to say, the neighbors were not happy. Actually, it seemed our neighbors weren’t ever happy. Not even on a good, prank-less day. Let’s just say the average Grimstown personality matched the environment – bleak at best, downright dead at worst. Once, a bunch of people stripped a guy down to this boxers on the steps of Town Hall and pelted him with prunes, just for whistling. Geez, I’d hate to think of what they’d pelt Grampa with if he ever got caught. Not to mention: Grampa in his boxers? Not a good visual. Anyways, Grampa was always making a mess of things and because of it Grimstown had endured a few near water shortages from all the hoses being on at once. Luckily, no one in Grimstown, as far as I knew, suspected Grampa: he had amazing skills at working on the sly. The rumor floating around was that the town was cursed by invisible, havoc-wrecking gremlins. When Grampa wasn’t at work or busy “wrecking havoc” on the neighborhood, he was usually in the attic, talking to himself in a mirror. And he used different voices, too. Mostly he discussed the weather and how the opposing team was still in the lead. Which opposing team I have no idea. As far as I knew, Grampa never watched sports. But he was pretty ticked off about it all the same. Sometimes, his conversations got really wacky, like the times he argued with himself. In one argument, part of him said he should leave because Grimstown was getting worse due to the disorder and the other part of him said he should stay because Grimstown was getting worse due to the disorder. I admit Grimstown was a super dreary town where everything was dry and brown. And yeah, it seemed to be getting worse. But that was no different than any other place on Earth, or so I heard Grampa say. And besides, he was the one causing all the “disorder”! He sure had a mind of another kind. I guess if you want to get scientific and bring up the topic of heredity, you could say that’s the one thing I inherited from Grampa: a messed-up mind. I have practically no memory from the time I was born till about seven months ago: not who my parents were, not what my favorite childhood toy was, not even where I was born. I could have come from Mars for all I knew. Except my skin’s not green like they say a Martian’s is. Grampa’s ears were kind of pointed, (and if he was from Mars, that would sure explain a lot) but he wasn’t green either, so I thought maybe I just came from Colorado or something. Grampa insisted I was in an accident and that’s why my memory was gone. But I just figured he was trying to hide the fact I’d inherited one too many threads from his crazy genes. I mean, surely if I was in an accident, I’d remember something about it. People are always saying things like, “The last thing I remember hearing before the horse kicked me in the head was…” or “The last thing I remember seeing before I fell off the cliff was…” But I don’t remember anything: not even the last thing that happened before. Grampa has told me the accident had something to do with my parents. He’s also told me that my dad’s dead. But whether or not he died in the accident, I don’t know. And I also have no idea about what happened to my mom. He’s barely ever mentioned her. Why? I don’t know that either. And every time I’ve tried asking him questions about my mom or my dad or anything about my past, Grampa would just give me a stinky, boiled root to chew on, and tell me to go draw. He never told me anything I wanted to know. And I sure couldn’t count on Griselda for any help in that department. Yeah, her name alone should be a hint. She was the housekeeper-slash-nanny from you-know-where. And I’ll bet my right eye she was probably the reason Grampa had gone loopy and spent so much time up in the attic, alone. And that’s how I pretty much spent most of my time, too: alone. Only I didn’t make a habit of pulling pranks and talking to myself. Although, come to think of it, maybe Grampa was onto something. Maybe sneaking around and talking to an imaginary friend could make life a little more bearable. Especially since I was stuck in Grimstown with no chance of escaping! I had no other living relatives. I was an Orphan With No Options: an O.W.N.O. And “oh no” pretty much summed up my whole life as I knew it. Join Smudge’s Mark on Facebook!